Elbit Systems announced that it has completed the delivery of the Ground Based Training System (GBTS) center for the M-346 “Lavi” trainer aircraft. This comprehensive training solution was selected by the Israeli Air Force (IAF) and the Directorate of Production and Procurement (DoPP), to effectively and affordably qualify its pilots and Weapon Systems Operators (WSOs) to progress directly to fourth and fifth generation fighter aircraft (F-16, F-15 and F-35). A fully networked solution for operational combat training, the GBTS consists of multiple simulators that are connected to each other, creating a joint network, which provides a nearly identical flight environment, obtainable without the time and expense of real flight. This advanced virtual-constructive training solution introduces cutting-edge technology that enables the IAF pilots to conduct effective and safe flight training, while ensuring their full-readiness in operating next-generation platforms. It delivers highly realistic and immersive conditions in a ground-based setting, further enhancing the IAF’s training capacity, by allowing its aircrew to better plan and perform full mission exercises – in much less time and using fewer resources. Based on cutting-edge simulation technology and training capabilities, the GBTS enables flight academy cadets, as well as graduate pilots and WSOs, to practice unusual and in-flight emergency procedures, and at a more advanced level, to simulate complex combat scenarios, acting as a solo pilot or as part of a formation. Embedded Tactical Training System (ETTS), Elbit’s cutting-edge technology live training system, provides live training within the GBTS as well as in the real aircraft. The Center’s simulators employ a real-image 360º display system, equipped with simulation models of actual weapons systems and high-fidelity Computer Generated Forces (CGF), which, working together, generate a wide range of immersive virtual combat environments. Users’ feedback after using the system is that “this is as close as it can get to real life scenarios”. In this unique project, Elbit Systems is the prime contractor and it developed and delivered the GBTS center to the IAF together with Alenia Aermacchi (Leonardo-Finmeccanica Group), CAE and Selex ES (Leonardo-Finmeccanica Group) following a selection by “TOR – Advanced Flight Training”, a jointly-owned company of Elbit Systems and Israel Aerospace Industries, responsible for the operation of the M-346 “Lavi” trainer aircraft. 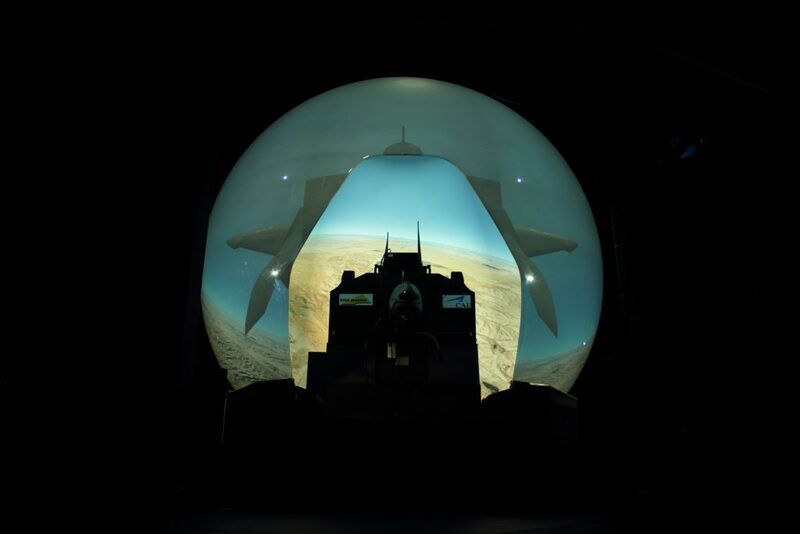 Blending combat experience with today’s innovative simulation technologies, Elbit Systems offers operational and tactical, virtual and embedded trainers and simulators to leading air forces worldwide. The company’s modular, flexible training solutions for airborne systems are designed to evolve and grow with customer needs. Elbit Systems provides computer-based trainers, partial task trainers, full mission trainers and complete training centers that comprise mission planning systems, simulators and debriefing systems. Its advanced combat training system introduces a cutting-edge training concept for lead-in trainers as well as fighter aircraft. Based on data link technologies incorporated into navigation and display systems, the system generates virtual sensors and systems as well as multiple types of threats – both airborne and ground for virtually any platform type. Elbit Systems, an acknowledged leader in this field , builds on over three decades of experience in training and simulation programs and offers comprehensive solutions that have the unique advantage of being based on actual, operational systems that the Company develops, manufactures and supplies. These solutions range from mission preparation, through execution, to post-mission debriefing and analysis. Using a building block approach incorporating COTS (Commercial- Off-The Shelf) components and specially designed simulation modules, our total, tailored solutions are designed to evolve along with customers’ needs. Simulator operation and maintenance are part of the total package.